Reviews of the piece on the blog. Of course, a piece of music can’t really be about a roundabout. More than that, this is a reminiscence of my teenage years, when I first started to become seriously interested in music. There were two strands to this. Firstly, I was starting to branch out from my Father’s transcendental but admittedly rather limited listening diet of Bach, Wagner, and, er nothing else, to explore the delights of jazz, experimental rock music, Stravinsky, and Bartók. My second way into music was through the soldering iron, literally getting my fingers burnt hacking together home-made noisemakers using transistors salvaged from broken hi-fi sets and the like. Commissioned by the Scottish Philharmonic Orchestra and first performed by them on 17/11/2008 at Òran Mór in Glasgow, with conductor Peter Cynfryn Jones and artistic director: Gordon Rigby. 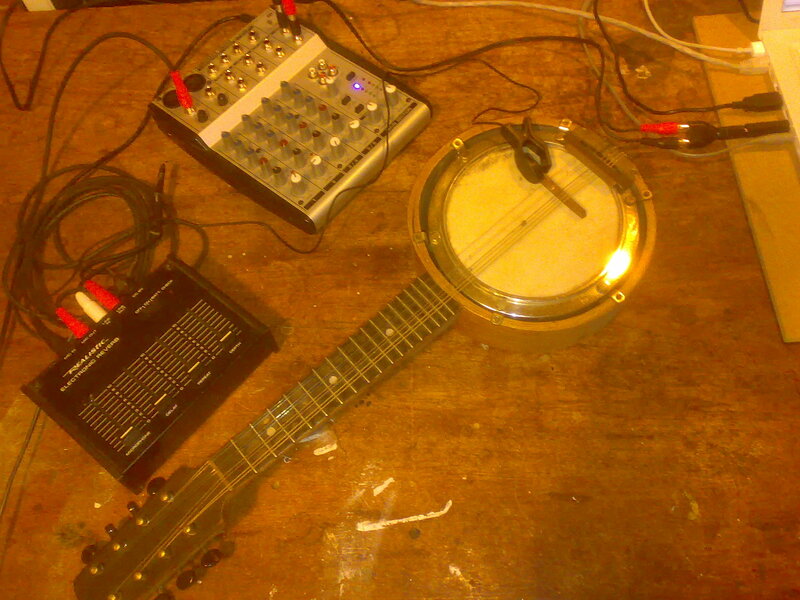 The improvised part was taken by the composer, using an amplifed banjo ukulele originally belonging to his grandfather through a circuit-bent effects unit.